AIER Launches The Debate Magazine | AIER. The Australian Institute of Employment Rights (AIER) today launched the first edition of its new magazine The Debate at Parliament House in Canberra. Launched by Professor Ron McCallum, the magazine explores the gaps that need to be filled in the Rudd Government’s Forward with Fairness regime, and includes contributions from Professor Ron McCallum, Professor Marilyn Pittard, Professor Joellen Riley, Mordy Bromberg SC, Mark Irving and Anne Gooley. Over the next few months the federal government will make decisions about the regulation of our work relationships that will shape how workers and employers think, feel and relate to one another. This is a unique opportunity, a chance to change workplace culture, and bring fairness to Australian workplaces. It needs to be a fairness based on good faith relationships and the desire to create dignity at work. With legislation changing towards more cooperative employment practices, employers are seeking tools that will help them align their practice with the new system’s standards. Several areas of the Rudd Government’s Forward with Fairness policy need fleshing out. Ron McCallum’s suggestions concern the proposed collective bargaining regime, the unfair dismissal laws, and the new agency Fair Work Australia. Mark Irving explains why employers, workers and their unions should be left to determine the content of their argument. If the United States is considering new legislation that would introduce compulsory arbitration for some interests disputes, why is Australia considering abandoning its industrial umpire? This report by AIER clearly articulates the gaps in the Rudd Government’s Forward with Fairness policy, offers solutions to these gaps, and argues that now is the time to lay the platform for fairness in Australian workplaces. There is a clear legal rationale for returning the unfair dismissal laws to the bulk of Australian workers. It’s not only employees in small businesses who suffer from a lack of unfair dismissal rights. Mordy Bromberg asks why the building industry needs a commission with ASIO-like powers to watch over it. This publication seeks to continue the debate on what constitutes a fair workplace, now, and into the future. The Institute also hopes that The Debate will act as a guide to those in parliament who have the responsibility to enact fair workplace laws. 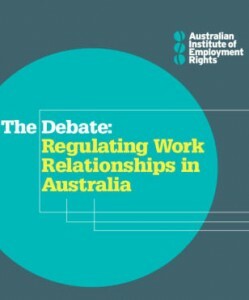 The Debate is an initiative of the Australian Institute of Employment Rights, an independent coalition of employers, employees, unions, academics and lawyers who collaborate to promote positive work relationships. The Debate Magazine is available to AIER members only. To become a member, click here.